Last July, Pamela and I found a first-in-state Great Blue Skimmer at St. Croix State Park, up near Hinckley, Minnesota. I really wanted to go back sometime this July to look for more. That didn't happen. On July 1st, the park closed and then on the same day it was also leveled by a major windstorm. Now they're saying it won't be open for any use until September 12, which should be just long enough to make absolutely sure any Great Blue Skimmers are done for the year before I can look for them. I can only assume I was getting close to secrets of odonate distribution that our species isn't ready for. Most of the parks stayed closed for about three weeks, which was frustrating, but did get me to finally try some of the state parks on the Wisconsin side of the border. There are two within an hour of my house, and they're both very good, but the one that really convinced me I've been missing out is Kinnickinnic State Park, which contains the confluence of a cold-water trout stream with the St. Croix River. I found two scorpionflies -- neither was interested in sitting for a portrait, but it's a treat just to see them -- and a few clubtail dragonflies, which tells me I need to go back in June, when there are more species flying. In late July it was mostly full of skimmers -- and nothing out of the way, just the usual kinds you can find anywhere when anywhere isn't closed -- but a nice variety of them, especially on the sandy delta at the mouth of the Kinnickinnic. The only problem with this site is that boaters stop along the edge of it to swim and shout things at each other, and their music is very boring. But it's nice for photography because you can walk around the patchy grass and little willows without trampling anything. Also, out-of-focus sand makes a good background. 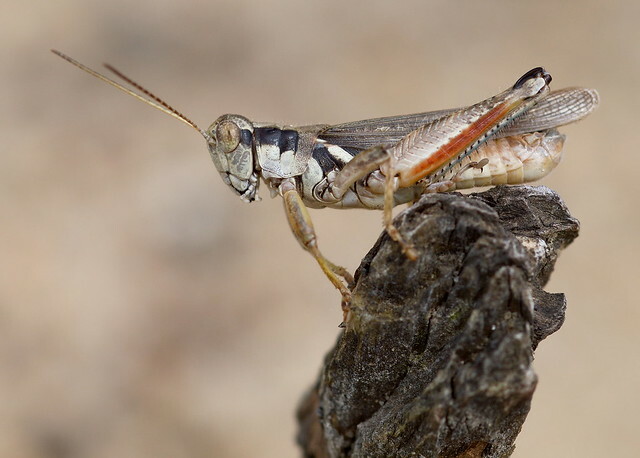 This is a spur-throated grasshopper -- you can see the spur, just in front of where the front legs meet the thorax -- but I don't know exactly what kind he is; possibly one of the many species of Melanoplus. 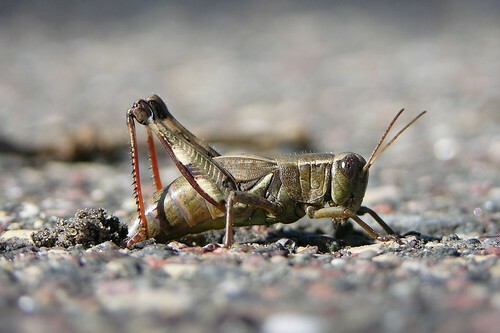 A short-horned grasshopper lays eggs in a hole in the pavement. Check out the raku glaze on her abdomen. 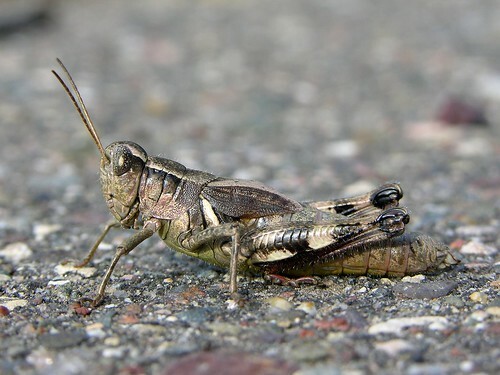 A lot of common, drab grasshopper species turn out to have wonderful color patterns when you look at them closely.